Brighten up the exterior of your home by adding color and beauty with the Mayne Fairfield Window Box Collection. This durable construction offers a low maintenance solution and cleans with just a simple rinse of a garden hose. This window box features a double wall design creating a water reservoir. This self-watering effect helps to retain the right amount of moisture and protect delicate roots from daily temperature extremes and encourage healthy growth. This results in healthier plants that require less watering. The weather-proof and ultra-tough construction allows you to enjoy your window box all year long with very little winter preparation. The UV inhibitors within the resin allows for a long lasting fade-free performance. The low maintenance nature of Mayne's Window Boxes means you will spend less time nurturing your plants and more time admiring them. Accent your home with our New England design window boxes. Our molded plastic planters are made from high-grade polyethylene, double wall design. Sub-irrigation water system, encourages root growth. Dimensions: 48"W x 11"H x 10.8"D and Weight: 20 lbs. Inside dimensions are 44″L x 7.5″W x 8″D, approximately 9.5 gallon soil capacity. Water reservoir capacity is approximately 4 gallons (15 Liters). 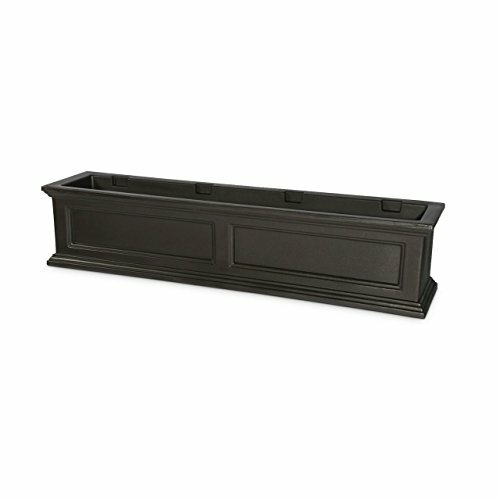 Window box comes with 4 wall mount brackets with a black powder coated finish. 15-year limited warranty. Dimensions: 48"W x 11"H x 10.8"D and Weight: 20 lbs. Inside dimensions are 44″L x 7.5″W x 8″D, approximately 9.5 gallon soil capacity.